Legal Assistant to Diane Cardoso, Esq. 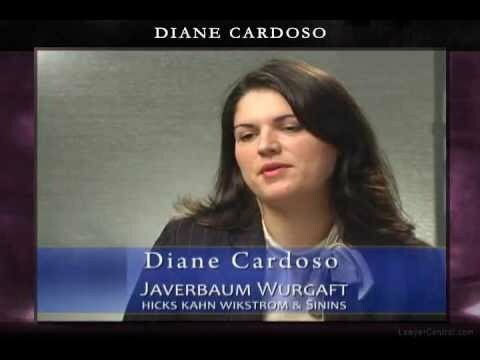 Diane L. Cardoso is a Partner at Javerbaum Wurgaft Hicks Kahn Wikstrom & Sinins and manages our Jersey City office. She has been Certified by the New Jersey Supreme Court as a Certified Civil Trial Attorney and is admitted to practice law in both New Jersey and New York State. Upon her graduation from Pace Law School, she served a Judicial Clerkship with the Honorable Dennis F. Carey, III. and the Honorable John C. Kennedy, Judges of the Superior Court of New Jersey. Her practice is concentrated in the area of civil litigation. Ms. Cardoso handles matters involving automobile negligence, premises liability, construction site negligence, legal malpractice and medical malpractice. She is fluent in Portuguese and Spanish. She is a Trustee of the Hudson County Bar Association. Additionally, she sits on the Civil Arbitration Selection Committee and Civil Practice Committee in Hudson County. Ms. Cardoso is a Board of Governor for the New Jersey Association for Justice and is presently a co-chair of that association’s Education Committee. She is also a Revitalization Board of Governor to the American Association of Justice. Ms. Cardoso is a 2017-2018 Fellow of the New Jersey State Bar Association Leadership Academy. Ms. Cardoso received the 2017 Professionalism Attorney of the Year Award from the Hudson County Bar Association and was named a Super Lawyer in 2016, 2017 and 2018. She was previously named a Super Lawyer rising start from 2013-2015. She has lectured previously for the Hudson and Essex County Bar Associations, the New Jersey Association for Justice and New Jersey Institute for Continuing Legal Education. Co-Chair, NJAJ Educational Foundation, “Trial Examinations 101”, April 26 & 27, 2012. NJSBA Leadership Academy Fellows Announced.